Not meaning to ruffle anybody’s feathers this morning when I say that today there will no doubt be thousands of dull sermons preached in pulpits all across America. So, as a favor to your friends who still sit in darkness, forward this short report and help them survive the dull sermons they undoubtedly will have to endure this Lord’s Day. By the way, before we look at these most helpful tips, I can’t help but muse for a moment over how Paul must’ve felt when a guy not only fell asleep during his long-winded sermon — but actually fell to his death! 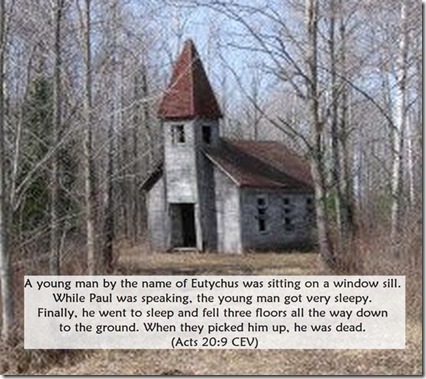 It was merciful of the Lord to raise the kid from the dead; and I’m sure Paul and his companions had some good laughs over that memory years later. The Lord knows we could use some resurrections in many of today’s churches — and also a boat load of good laughs. 1. Pass a note to the worship leader asking whether he or she plays requests. 2. Move to as many different seats as possible, without being too obvious. 3. Raise your hand and ask for permission to go to the bathroom. 4. Scratch you arm and shoulder and see how many other people you can make itch. 5. Stare at the preacher with your eyes wide open. 6. See if a yawn really is contagious. 7. Slap your neighbor and see if they turn the other cheek. If not, raise your hand and tell the usher. 8. Signal to the minister that his fly is undone. 9. Draw your arms up into your sleeves and turn your shirt around backwards. 10. Start from the back of the church and try to crawl all the way to the front, under the pews, without being noticed. Give these a try today; you never know…a revival just might break out in your church as a result!